David Grün (1886-1973) was born in Poland and at just 14, already started a Zionist youth club with friends to promote immigration to Israel and study of Hebrew. While a student at the University of Warsaw in 1905, he was arrested twice as a member of the socialist Poalei Tzion party. The following year he made his way to the Holy Land and settled there. Just 20 years old, he became the chairman of Poalei Tzion in Yafo. Due to various disputes, Grün left politics and focused on farming in Petah-Tikva and the Galilee. He joined an armed defence group in 1908 to protect Jewish settlements increasingly under attack. 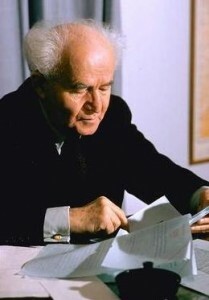 In 1912 he temporarily relocated to Istanbul to study law, and it was there that he Hebraized his name to Ben-Gurion (and would convince countless others to do the same over the course of his life, wanting them to drop their old “diaspora” names for a fresh start in a newly resurrected Jewish Homeland). He returned to Jerusalem, only to be deported to Egypt due to World War I, then made his way to the U.S. where he toured for 3 years raising support for the Jewish cause. In 1918 he enlisted in the Jewish Legion of the British Army. After the war, Ben-Gurion resettled in Israel and established the Histadrut, Israel’s first labour union (which is 650,000 members strong today). By 1935, he became the chairman of the Jewish Agency – the largest Jewish non-profit organization in the world – overseeing the immigration and settlement of Jews in Israel. He served in this role until 1948, when he became the new State of Israel’s first Prime Minister. One of his first acts in the ensuing War of Independence was the fusion of all militias into one unified army: the IDF. After the war, he worked tirelessly to establish the state and its institutions, overseeing massive construction projects and mass immigration of Jews from around the world, not to mention an international hunt for Nazi war criminals. Although he worked to create a free, modern, non-theocratic state of Israel, he ensured that the Jewish essence would remain, setting Shabbat as an official rest day, kosher food in all state institutions, and autonomy in religious education. He also focused on Israel’s military might, ordering the creation of special operations units while pushing heavily for attaining nuclear capability. He would serve as prime minister in two stints lasting nearly 14 years, in addition to being minister of defence. After retiring in 1970, he wrote an 11-volume history of Israel’s beginnings, adding to two previous tomes he had written. He passed away shortly after, and is commemorated as the central founder of the modern State of Israel. Oil, which saturates everything it comes in contact with, represents innerness. Wine, which causes the heart to spill out its deepest secrets, represents outwardness. Chanukah is oil, Purim is wine. This entry was posted in Law, Politics & Military and tagged Ben Gurion, British Army, Egypt, Galilee, Hebrew, Histadrut, Holy Land, IDF, Israel, Israeli Army, Istanbul, Jaffa, Jerusalem, Jewish Agency, jewish legion, Kosher, Minister of Defence, Petah-Tikva, Poalei Tzion, Poland, Polish Jews, Prime Minister, Shabbat, University of Warsaw, War of Independence, Yafo, Zionism, Zionist on November 27, 2013 by Jew of the Week.